It doesn’t take more than a minute or two of conversation with Mike’s Bait on 8’s newest pro staffer, Caleb Wedger, to pick up on the fact that when it comes to fishing, he may have a bit of an obsession. This same “never wanting to go back to the dock” attitude has led Caleb to spend countless hours on the water trying to perfect his craft. From his honey holes of the Northeast Metro around Forest Lake, MN (where Caleb was raised) to the big waters of Mille Lacs, Red lake, Pool 4 on the Mississippi, Rainy Lake and Lake of the Woods, to as far south as fishing Gar in Texas and Tarpon in the Florida Keys ...he just loves to be on the water. Caleb brings a great depth of knowledge on all species but admits that muskies and walleyes really get him fired up. 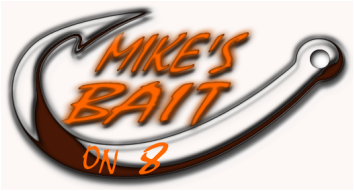 As both a fishing guide and tournament angler Caleb hopes to offer Mike’s Bait customers access to reliable knowledge, honest opinions on the latest gear and tackle, and tips to the hottest bites! Ben guides in central Minnesota and Wisconsin for multi species. Hes on the water year round and has you covered no matter the conditions!